This photo shows a gaslight in South Orange with the Newark and New York skylines in the distance. The property will be open from 10:00am to 4:00pm on these days. Admission is $5, and is free for children under 12 and members. Greenwood Gardens is located within Old Short Hills Park at 274 Old Short Hills Road. Orange Mayor Dwayne D. Warren's 'Taste of Orange Mayor's Restaurant Tour' will continue in December at multiple Orange eateries. According to a post by Mayor Warren on the city Facebook page, the tour was "created to draw attention to our City’s diverse restaurant scene". The tour started this month at Sandwiches Unlimited, Ken's Coffee Shop, and Mama Lola BBQ Restaurant. Suggested admission is $12 for adults and $7 for children, seniors and students. Free admission for city residents. A Holiday Open House will take place in Downtown West Orange on Saturday, December 6. The day will start with a Breakfast with Santa at Our Lady Of Lourdes Church at 1 Eagle Rock Avenue from 9:00am to 10:30am. The cost is $10.00 per family, and includes pictures with Santa. The breakfast is sponsored by the Unconditional Love Christian Fellowship Church. Reservations are recommended, and can be made by sending an email to JensenRoyJ@gmail.com or calling 862-216-8424. From 10:00am to 4:00pm, a Holiday Winter Bazaar and Craft Show will take place at the West Orange Community House, located at 242 Main Street. Over 25 crafters, artists, and retailers will have booths at the craft show. Admission to the bazaar is free. In addition, guided trolley tours of West Orange will run on the hour from 11:00am to 4:00pm. Riders will visit Llewellyn Park, Main Street, and Eagle Rock and learn more about the history of each place. The tours will be provided by Mayor Robert Parisi, Terry Jung of Thomas Edison National Historial Park, township historian Joe Fagan, and members of the West Orange Township Council. The tours are free, and start at the West Orange Community House. Reservations are recommended, and can be made here. The first annual Winterfest will take place throughout December in Downtown Newark. The festivities will start on Monday, December 1 at Championship Plaza outside of the Prudential Center. On that day, Mayor Ras J. Baraka will conduct a ceremonial lighting of the 40 foot tree at the plaza at 4:45pm. At 5:00pm, there will be live holiday music from the Special Ensemble, an award winning youth performance group. The Special Ensemble will also perform on December 13 at 4:30pm. On December 4, 11, 13, and 18, horse and carriage rides through Downtown will be open to the public. Tickets are $5 and are free for children ages 12 and under who ride with an adult. The horse and carriage will run from Championship Plaza to NJPAC and return using Mulberry Street. Also on those days, visitors can shop for holiday merchandise at the Winterfest Marketplace at Championship Plaza. In addition, during December, Fan Fests before New Jersey Devils home games will feature a variety of activities and giveaways. Winterfest is presented by the Newark Downtown District and the Prudential Center. Click here to learn more. The second annual Springfield Avenue Holiday Celebration will take place on Sunday, December 7 at the Springfield Avenue Gazebo starting at 3:30pm. The celebration will feature live music from Bruno Lee and Friends, storytelling for kids, refreshments, pictures with Santa, and lightings of the tree, menorah, and kinara. The gazebo is located next to the Hilton Branch of the Maplewood Memorial Library at the corner of Springfield Avenue and Tuscan Road. The event is sponsored by the Park Wood Diner and presented by the Maplewood Recreation Department and the Springfield Avenue Partnership. 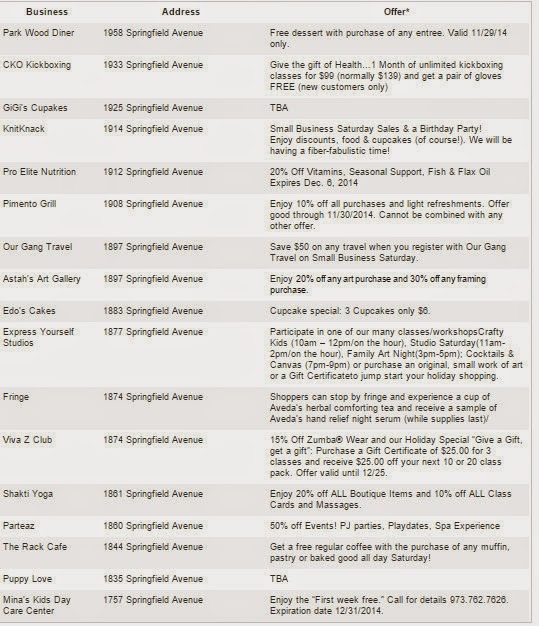 In addition, Springfield Avenue will also take part in Small Business Saturday on November 29. Businesses that line the avenue will offer discounts to visitors. The full list of participating businesses from the Springfield Avenue Partnership is below. Belleville High School will be the place to be on Saturday, December 6. The school is hosting Belleville Township's Annual Holiday Tree Lighting Ceremony from 6:00pm to 8:30pm. In addition to the tree lighting, there will be music, free refreshments, food vendors, pictures with Santa, trackless train rides, horse and carriage rides, a gift show, and a Holiday flea market. The festivities are presented by the Belleville Recreation Department. Belleville High School is located at 100 Passaic Avenue. The event is free and open to the public. The deadline for the West Orange Chamber of Commerce Scavenger Hunt has been extended to December 3. Those interested in winning a prize must answer all of the questions about West Orange business trivia on the Chamber of Commerce website correctly. Questions range from "What are the pool hours at JCC MetroWest on Tuesdays?" to "Where are Jordan Baris Realtors offices located?" and "How many actual flavors are available at Mark & Julie’s Ice Cream?" The winners will be selected randomly, and will be announced at the West Orange Tree Lighting Ceremony on Friday, December 5. The scavenger hunt is free to enter, and participants must be 18 years old or older. Only one entry per person is permitted. (As of 1:30pm) Several inches of snow has fallen in Essex County so far today, and more snowfall is expected. Reports from the National Weather Service indicate that West Essex will be most affected, with 6.6 inches expected in Fairfield and 6.2 inches expected in Livingston. 5.8 inches of snow is expected to fall in South Orange, 5 inches in Newark, and 5.5 inches in Nutley. In Essex County, New Jersey Transit is cross honoring tickets with PATH trains and local Coach USA bus routes 24, 31, and 44. South Orange will have another place to celebrate the holiday season this year. On Friday, December 12 from 5:30pm to 8:30pm, Irvington Avenue will host "Light Up the Holidays". Scheduled activities include the first annual Irvington Avenue holiday tree lighting, pictures with Santa, crafts for kids, live music, refreshments, and specials at Irvington Avenue restaurants. All activities will take place at the corner of Irvington and West Fairview Avenues. The celebration is presented by the Village of South Orange, the Seton Hall University Student Government Association, and the Irvington Avenue Corridor Advisory Committee (IACAC). Dozens of students at Columbia High School in Maplewood walked out of the building this morning to protest the decision by a St. Louis County, Missouri grand jury not to indict Ferguson city police officer Darren Wilson on charges relating to the death of Michael Brown. The walkout took place during the reading of the Pledge of Allegiance at approximately 9:10am. Students protested nonviolently in front of the Parker Avenue school for several minutes before reentering the building and marching in the hallways. CHS principal Elizabeth Aaron made an announcement to students and staff members at 9:43am asking students to "please return to (their) period 3 classes". Aaron also asked teachers to step out into the hallways to supervise. Multiple student walkouts have taken place in the South Orange Maplewood School District in recent years. In 2012, South Orange Middle School students walked out of class to protest the decision made by school officials not to give tenure to two teachers. In 2010, students at CHS walked out to protest Governor Chris Christie's proposed budget cuts to education. This photo shows the Dickens Village in Maplewood, which was set up this week for the holiday season. A new restaurant has opened in the South Orange Village Center. The Soup Cafe opened Friday morning at the former Eclectic Cafe and Catering space at 61 Academy Street, next to Harusame Japanese Cuisine. The Soup Cafe serves a variety of Carribean style soups and sandwiches made to order including Smoky Jerk Chicken and Manish Water. "The inspiration for The Soup Cafe comes from the genuine love of the world's most beloved comfort food, soup", said manager Nadia Dale. "Our team worked for months on a unique concept for our cafe and came up with perfect combination of authentic Caribbean and Classic American soups". The restaurant is open Monday through Saturday from 11:00am to 4:00pm. This photo shows a pigeon along the Rahway River East Branch in South Orange. Signs for the former Jersey Animal Coalition (JAC) shelter in South Orange were recently removed, including on the Department of Public Works driveway and on Walton Road. When PlaceNJ.com visited the shelter on November 12, a sign was posted on the front door reading "Our shelter is now closed. All animals formerly in the shelter are safe and have been placed in caring homes/facilities", adding that "our security cameras are in operation and Police Department has been advised". However, the sign was removed as of the following day. The JAC moved out of the building on November 11th after occupying the building for nearly 10 years. Adoptions were concluded in October. Representatives from the Village of South Orange and Jersey Animal Coalition did not respond to our requests for comment. This photo shows the start of Midland Boulevard in Maplewood. This photo shows the Maplewood Veterans Memorial outside of the Municipal Building. Update 7:51pm: Columbia High School in Maplewood was on code red lockdown today for nearly two hours. According to Maplewood Police Chief Robert Cimino, a student was arrested in a classroom for allegedly bringing brass knuckles to school. At a press conference, Chief Cimino said that a CHS staff member called police at approximately 12:30pm to report that a weapon was present in the school. Chief Cimino added that there was "great cooperation of the students...(and)...great cooperation of the staff". A lockdown alarm was activated in the school at approximately 12:40pm. The school remained in lockdown until 2:20pm. There were no reported injuries. Acting Superintendent James Memoli sent an email to parents at approximately 5:00pm. "The safety of our staff and students remains our first priority", said Memoli. According to a press release from the Maplewood Police Department, "anyone with information on the incident is urged to contact the Maplewood Police Department Youth Aid Bureau at 973-762-3400". Update 2:21pm: Lockdown has concluded. At approximately 2:20pm, a Maplewood Police lieutenant told students and staff that the "lockdown is officially over". At least one student is rumored to be in custody. Healy told staff members that there would be an emergency meeting after school. Update 2:10pm: Columbia High School in Maplewood is under Code Red lockdown. A lockdown alarm went off in the school at approximately 12:41pm. Assistant Principal Michael Healy informed students that this is an "Active Shooter" lockdown. The alarm sounded for at least ten minutes. South Orange and Maplewood Police conducted a security sweep of the building. Healy announced to students that there are 12 teams of officers. Officers entered classrooms at approximately 1:20pm and asked students and staff to remain in their classrooms. As of 1:49pm. Healy asked students and staff to remain in their classrooms until police officers unlock the classroom door. "Please stay in place", Assistant Principal Charles Ezell announced to students at approximately 1:30pm, adding that "everything is okay". The alarm went off during Period 7, which is a lunch period at the school. Several students were outside of the building when the siren sounded. CHS does not normally conduct lockdown drills during lunch periods. As on 1:25pm: Columbia High School in Maplewood is under Code Red lockdown. A lockdown alarm went off in the school at approximately 12:41pm. PlaceNJ.com will continue to report live from inside the building. A code red “lockdown” was ordered this afternoon at Columbia High School by the Maplewood Police Department as a precautionary measure. All students are safe and everything is under control. Additional details will be provided as soon as they are available. Shortly before 1 p.m. today, a code red “lockdown” was ordered at Columbia High School. High school administration had been informed of a potential threat involving a CHS student and a former CHS student possibly involving weapons. The administration notified the Maplewood Police who then initiated the code red as a precautionary measure. South Orange Police were onsite to assist. The police conducted an organized search of the building and one student was apprehended. The police continue to investigate the circumstances surrounding this event. Code red procedures were followed with police going door to door to check all rooms before clearing the code red. Many students were outside the school because the lockdown began during a lunch period. Security guards and administrators were outside with the students. Nobody was harmed during this event. We appreciate the cooperation of the police departments, the staff, the students and the building administrators. Parents and guardians of our students can be assured that the school administration works closely with and cooperates fully with law enforcement during such an event. The safety of our staff and students remains our first priority. The supervisor of security at CHS told PlaceNJ.com that "I hate that it happened, but the response was excellent". Read more here. Columbia High School Principal Elizabeth Aaron criticized media coverage of the lockdown and the arrest of teacher Nicole Dufault. Read more here. This photo shows the view of New Jersey and New York from the New Jersey Audubon Montclair Hawk Watch on November 4.